We are pleased to announce the recipients of this year’s Industrial Assessment Center (IAC) Outstanding Student and Distinguished Alumni Awards. 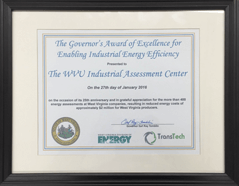 These awards recognize students and alumni who have made a significant impact through their work in energy efficiency and outstanding accomplishments in promoting the practices and principles of energy engineering. 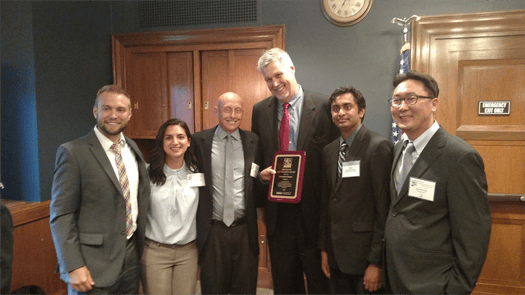 The Advanced Manufacturing Office’s Industrial Assessment Center (IAC) program was recognized during a bipartisan briefing on Capitol Hill sponsored by U.S. Senator Jeanne Shaheen (D-NH). Speakers commended the significant impact that the IAC program has on manufacturers and students alike. 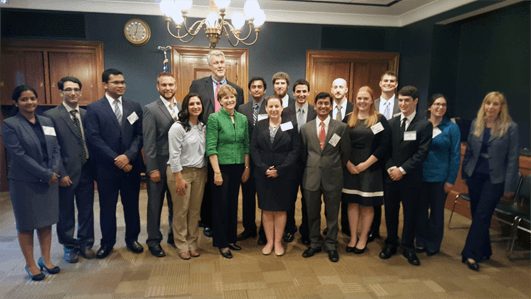 The Department of Energy's Deputy Assistant Secretary for Energy Efficiency, Dr. Kathleen Hogan, highlighted the important role that the IACs play in addressing an underserved population of small- and medium-sized manufacturers. Other speakers included Dr. Michael R. Muller, IAC technical field manager at Rutgers University; Bert Hill, Volvo Group North America; and Dr. Sudhakar Neti, Founding Director and current Assistant Director of the Lehigh University IAC. To read more about this event, read the blog here. U.S. soldiers are participating in an Energy Department supported program that provides hands-on education for engineering jobs. The Industrial Assessment Center (IAC) program, is open to all engineering students at participating colleges and universities, but many veterans find that they can use the program to further develop many skills they obtained through their service. Picture to the left: Military veterans Daniel Barclay (top left), Keith Striby (bottom left) and Youseff Elkassis (bottom right) are three examples of military participants in the Energy Department’s Industrial Assessment Center program that is helping prepare these soldiers for life outside the military as engineers. The U.S. Department of Energy (DOE) announced approximately $35 million in funding, subject to congressional appropriations, to assist small- and medium-sized U.S. manufacturers with increasing their energy efficiency, productivity, sustainability and competitiveness and to help address the shortage of engineering professionals with applied energy-related skills. The Industrial Assessment Centers (IAC) program provides hands-on training and extensive education for undergraduate and graduate engineering students in manufacturing processes, energy assessment procedures, and energy management systems. Led by engineering faculty, the selected IACs will perform on-site assessments at small- and medium-sized manufacturing business partners, currently defined as having gross annual sales below $100 million, fewer than 500 employees, and annual energy bills between $100,000 and $2.5 million. To view additional details about this funding opportunity, please click here. Mark Johnson, Director of the Advanced Manufacturing Office of the US Department of Energy, presents the University of Dayton IAC with the 2015 Center of Excellence award. 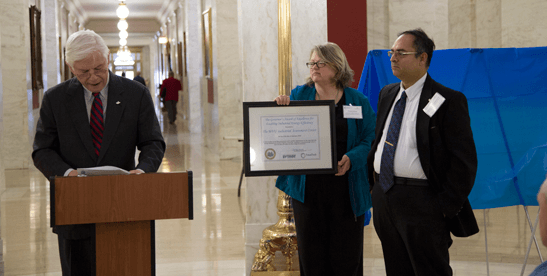 The U.S. Department of Energy awarded the University of Dayton's Industrial Assessment Center the 2015 Center of Excellence Award. It's the second time the center has won the award (2003). Since 1981, the University of Dayton's center, using teams of students and faculty, has performed more than 900 assessments, helping manufacturers reduce their energy use by about 7 percent. In a typical year, the center saves companies the equivalent electricity use of 1,300 houses and the equivalent natural gas use of 280 houses. 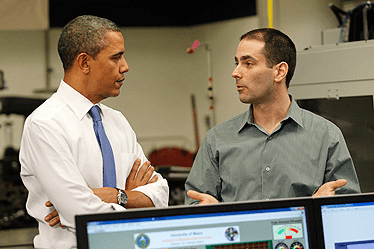 President Obama toured the Miami Industrial Assessment Center, where engineering graduate student Jason Grant explained the government-supported programs' mission and projects. In February 2012, President Obama highlighted the Industrial Assessment Centers (IAC) as a smart and important piece of the administration's "all-of-the-above" approach to domestic energy sources. President Obama said, "We're taking a step that will make it easier for companies to save money by investing in energy solutions that have been proven here at the University of Miami -- new lighting systems; advanced heating and cooling systems that can lower a company's energy bills and make them more competitive."